As a key element of road safety and safety at work, the alcohol and drugs testing technology has improved. Breathalyzer devices now provide relevant measures of alcohol concentrations in expired air. They exist in portable or fixed versions (such as ignition interlock – IID – devices). 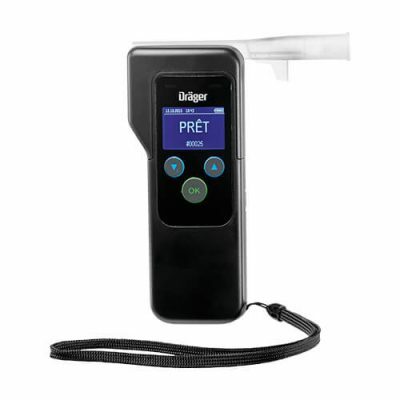 The advanced design of the DA3820 and DA5820 portable breathalyzer from Dräger allows professionals to quickly and easily perform breath alcohol measurements. The testing process through these devices is designed for hygienic use and provides highly reliable results. These devices can also monitor alcohol concentrations in ambient air (passive method) without using mouthpieces. 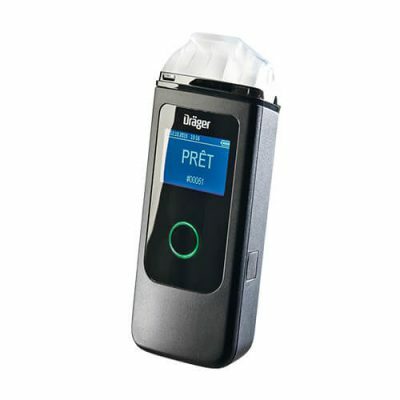 The Dräger DA3820 and DA5820 breathalyzer devices use the same sensor technology as the professional devices Dräger provides to the French police professional breathalyzers which carry out 30 millions of breath alcohol tests per year. An ignition interlock device, or IID, is a regulated unit used for public transport. More and more buses that carry children – including school buses – have to be equipped with interlock breathalyzers worldwide. This regulation tends to extend to every bus. Besides, more and more companies are using this technology for their vehicles. Alcohol interlock systems are automatic systems that require drivers to blow into a breathalyzer fitted inside their car. They can be adjusted to fit in different limits – according to any country legislation – but generally the vehicle can only be started if no alcohol is detected. Experts for transport safety have hailed this technology as a major component in reducing road deaths. 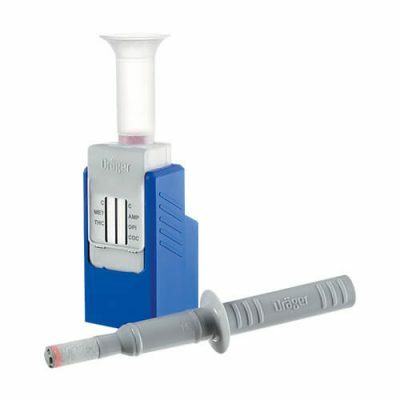 In many countries personal single-use breathalyzers are now disputed because of their ethanol reagent toxicity. Its disposal has to be performed aside from the classical recycling circuits. This matter does not arise for electronic breathalyzers as they are reusable (except for the plastic-made mouthpiece). They only require a calibration every six months in order to get constant accurate measurements. 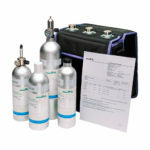 Ethanol (C3H6O) calibration gas cylinders are made of aluminum. These disposable cylinders are filled with precise and known concentrations (usually 260 ppm). They are gravimetrically mixed under the ISO6142 standard and ensure accuracy, stability and maximum shelf life. In addition to our electronic alcohol breathalyzer range, we also offer drug test devices for the following substances: cocaine, opioids, cannabis, amphetamines and methamphetamines. This system is composed of a saliva drug test swab unit and a cassette filled with reagent liquids. The testing time is set between 3 and 5 minutes depending on measurements sensibility. Once a substance is not detected, a line clearly displays facing the category. This kind of device is certified as a medical unit in the EU – 98/79/IEC regulation – and can be used for professional applications. The Alcotest® 3820 digital breathalyzer can measure within seconds the alcohol breath concentration in expired air. Replaceable mouthpiece available in hygienic packaging. Especially designed for professional use, the DA 5820 electronic breath analyzer can swiftly perform breath analysis to measure alcohol rate in the breathing tracts. Ethanol gas cylinder for interlock systems and digital breathalyzer calibration. 5 available concentrations: 50, 120, 192, 200 and 260 ppm. Aerosol cylinder for low volume calibration. Also available in standard 34L or 110L cylinders. Optional regulators: operated or push button. Fully compatible with all interlock systems brands. The Drugcheck 3000 can swiftly and reliably detect drugs – Cocaine COC, Opioids OPI, Cannabis THC, Amphetamines AMP, Methamphetamines MET – through oral fluid (saliva) samples. Sample clear indicator (color display). Entire drug test within 3 to 5 minutes.